I tried making this card with a tree cut out from one I had embossed with gold but not that pleased with the outcome but here it is anyway. 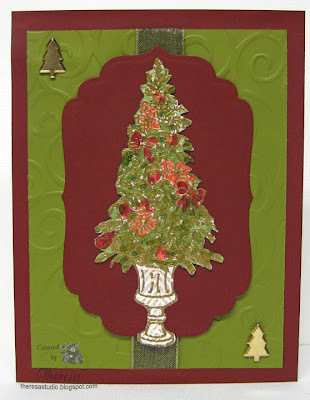 Joan's Garden Challenge: Card to have a tree (any kind), an embossed object (not a background) , something cut out with a die , and brads. My tree is heat embossed with Gold EP as well as dry embossed ...the tree with CB EF Swiss dots and the pot with CB EF Herringbone. If you enlarge the photo, you may see the details better. Mat for tree is cut with a Spellbinders Label 4. Gold metal trees are brads. 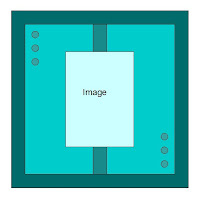 ABC Christmas Challenge: Use sketch shown on right. V is for vertical and there should be more than 2 items on the card that start with V. Have to stretch to have my 'V''s but here goes: Versamark ink for embossing, Stamp used for tree is from "Very Merry Christmas" set, ribbon is Vertical as well as card, and Brads are Very Shiny. This is amazing. Love all the dimension! Beautiful tree Theresa! And good luck in both challenges! Lovely card - love the rich colours! Great take on the sketch.Thanks for joining us at the ABC Christmas Challenge!And good luck.